In 2010 the Sofia Municipality, supported by the new Mobility centre, the University of Architecture and Civil Constructions and experts from two EU-projects (BENEFIT and EPOMM PLUS) started introducing a new parking policy in the city aiming to reduce the use of private cars in the city centre.For the first time in Sofia a survey on parking capacity, duration of parking and behavior of users (drivers) was carried out in large administrative and residential areas. The methodology was applied on GIS using a database for automate mapping of results and generating a series of reports from the analysis. Special counters recognized the parking places on the maps and recorded the registration numbers of the vehicles parked. It was possible to distinguish the category of car parking (free, paid per hour, service subscription). Also, erroneous and/or illegally parked vehicles could be registered separately. - relevance of the parking category. It was possible to make further analysis about the use of parking places and draw future trends. The results should be used for planning a new parking policy in Sofia as one of the most effective Traffic Management measure. 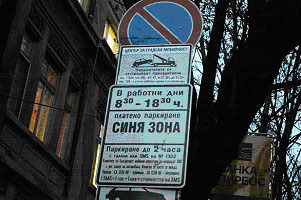 Drivers in Sofia were to be affected by the new parking regulations as the "blue zone" paid parking areas in the city center and main streets were expanded.>At the end of January 2011, it was announced that parking rates in the centre of Sofia will be increased starting 2012, with residents of the streets in the "blue zone" having to pay 120 BGN (60 EUR) for an annual ticket. The goal, according to Sofia municipality, was not only to increase revenue gathered from the paid parking spots, but also to expand the parking area available to motorists and to reduce traffic congestion by about 25 per cent. Starting from September 2012, parking along those areas was be taxed one BGN (0.5 EUR) an hour. The pavements along central boulevards have already been fitted with markings and signs and anti-parking barriers, protecting the greenbelts and pedestrian zones. Sofia's municipal council said the measure aimed to improve "traffic and parking organisation" in the area. Within the new expansion of the 'blue zone', there are 380 regular slots and 21 for vehicles belonging to handicapped residents.In the beginning of 2012, the Sofia Municipality published a new proposal for increasing the time for the "blue zone" with 2 more hours and creation of the "green zone". The new concept is still under discussion but it is expected to be introduced since september 2012. The new Sofia parking policy shows that the decision makers in the Bulgarian capital are on the "right track" concerning transport and mobility in the city. It would be advisable to meet the requirements of the citizens by providing more transparency about spending of the money from parking fees. When people see their money are spent for improving the mobility in the city, they will be more supportive to the new parking policy.